Occasion: This Bodycon Dress For Women is perfect for business,party, wedding, prom, cocktail, evening, club, bar or casual etc. Colour:Black,White,Purple;O Neck,Long Sleeve,Ruffle, Knee-Length,Back Hidden Zipper. Garment Care:Hand wash cold water. Do not bleach. Dry flat. Iron Low. 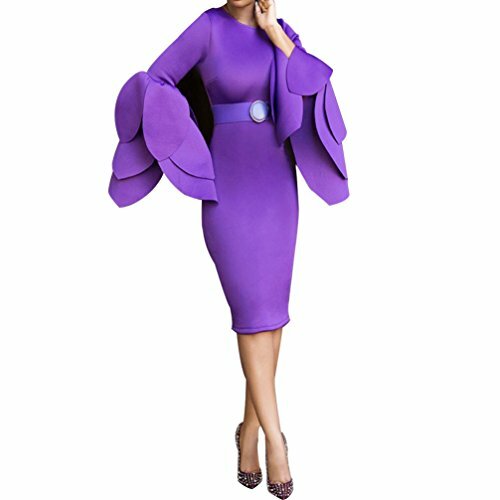 Material: This Bodycon Dress For Women Made of Polyester and Cotton; Colour:Black,White,Purple;O Neck,Long Sleeve,Ruffle, Knee-Length,Back Hidden Zipper. PLS read the size chart in the detailed picture on the left carefully,not the ones by Amazon on the side of the item that you click.If you are not sure of the size, one size up is a good idea. Occasions: This Bodycon Dress For Women is perfect for business,party, wedding, prom, cocktail, evening, club, bar or casual etc.